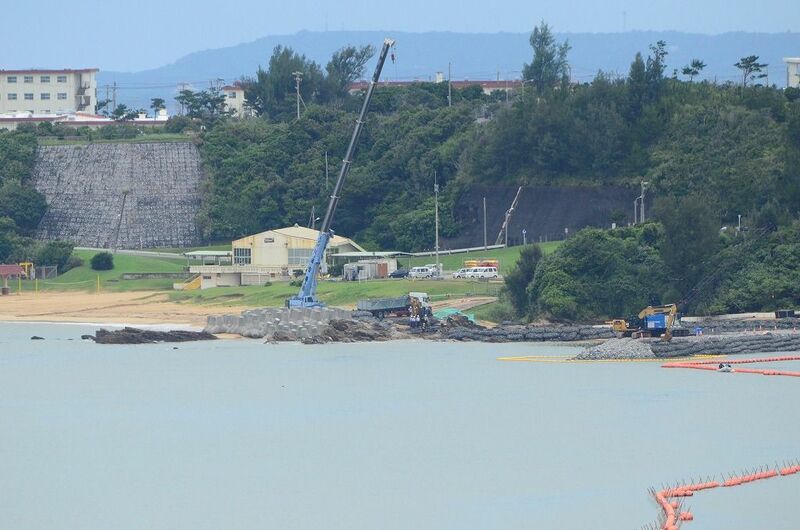 Cranes and construction workers transferring bags of gravel from trucks to the beach on June 15 around 11:30 am near the construction site for the K9 seawall on the coast of U.S. military Camp Schwab in Henoko, Nago City. On June 15 around noon, more than 30 construction vehicles were seen intermittently entering the U.S. military Camp Schwab. These vehicles are for relocating the U.S. military Futenma Air Station to Henoko, Nago City. About 100 citizens sat outside the gate and protested the new base construction. Participants also voiced their anger regarding the anti-conspiracy law that was passed that very morning. They said that the new law specifically targets Henoko and Okinawa Prefecture and that they will push aside the law by working together. Meanwhile, cranes were seen transferring bags of gravel from trucks to the beach at the construction site for the K9 seawall along the coast of Camp Schwab.